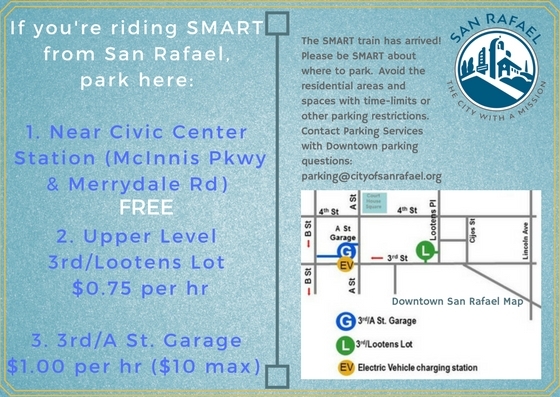 If you’re taking the train from the Civic Center SMART station, riders should park along McInnis Pkwy., which runs parallel to the Civic Center station. Additional street parking is available on nearby Merrydale Rd., the frontage road on the west side of Highway 101. The street parking there is just north of the train tracks, and there is a walkway that leads to the station. SMART rider parking is not allowed on Civic Center property. Parking on Civic Center property is reserved for people conducting business with the County of Marin or attending Marin County Superior Court, the Marin County Farmers Market, or events at Marin Center, including Veterans’ Memorial Auditorium. The upper level of the 3rd/Lootens Pl. parking lot (approximate 8 minute walk). This level is all day parking. The lower level is 2-hour parking only. The cost is $0.75 per hour. The Parkmobile app may be used to pay for parking here. Check it out! The 3rd/A St. parking garage (approximate 10 minute walk). This is all day parking. The cost is $1.00 per hour. *City of San Rafael Municipal code 5.40.030 states vehicles may not remain parked upon any city street for 72 or more consecutive hours.